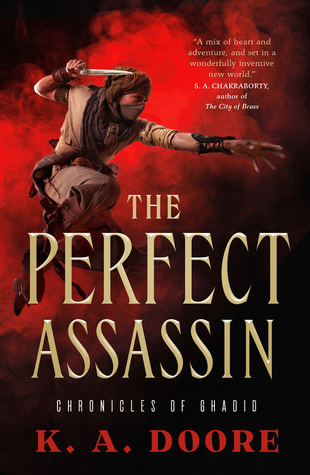 My thanks to Ace/Roc/DAW and Berkley for the following ARCs: Beneath the Twisted Trees by Bradley P. Beaulieu is the fourth book of the Song of the Shattered Sands series; it’s hard to believe the series is so far along now and I’m two books behind! Salvation Day by Kali Wallace is a sci-fi thriller about a lethal virus awoken on an abandoned spaceship–which sounds right up my alley. And Storm Cursed by Patricia Briggs is the eleventh installment of the long-running and excellent urban fantasy series, Mercy Thompson. I was so excited when this one made a surprise appearance earlier this week on my doorstep. 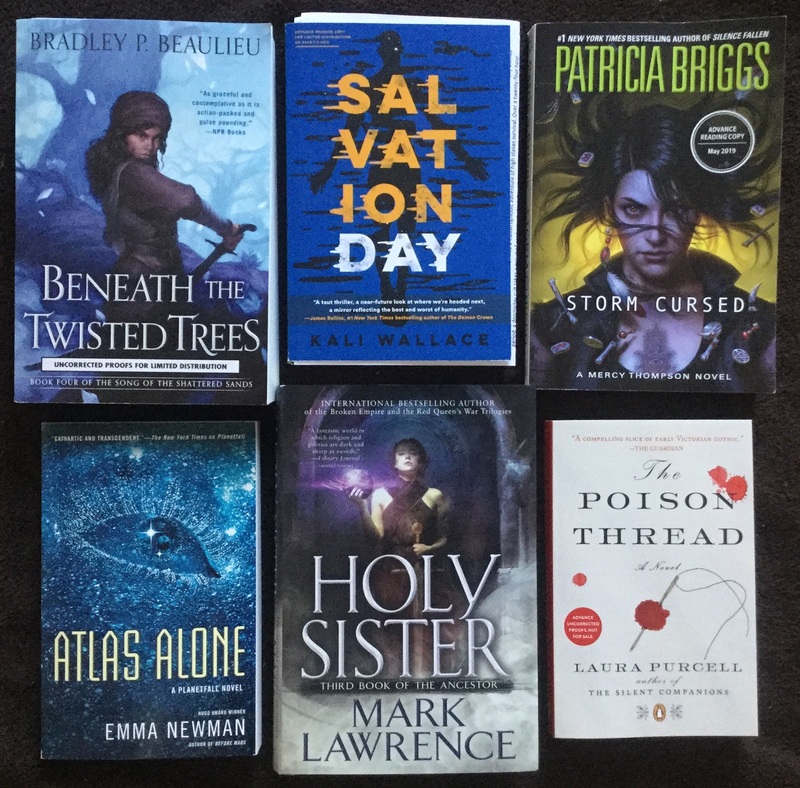 The publisher also sent along finished copies of Atlas Alone by Emma Newman and Holy Sister by Mark Lawrence. With their release dates fast approaching, I have plans to read both in early April. And from Penguin Books, I also received an ARC of The Poison Thread by Laura Purcell, the same author of The Silent Companions, which I read and loved last year. It’s also known as The Corset in the UK, and I’m so glad to know it’s coming stateside soon. Speaking of the UK, this month I received a trio of surprise airmail packages from the kind folks at Jo Fletcher Books. Morhelion by Dominic Dulley is the second novel of The Long Game, sequel to Shattermoon which I haven’t read. I’d not heard of this series before, but the premise about an alien war sounds interesting. If I find out that I can jump in at book two without getting too lost, I’ll probably check it out. I’ve also been hearing some really good things about Our Child of the Stars by Stephen Cox lately, so I was pretty excited when a copy showed up. A couple of the bloggers I follow have described this as enchanting, heartwarming, and spellbinding, so that’s definitely put it on my radar. 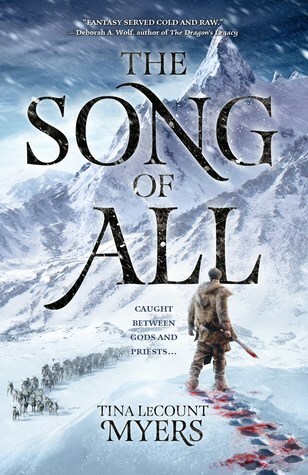 And Hearts of Ice by David Hair is book three of the Sunsurge Quartet, the follow-up to the author’s Moontide Quartet. 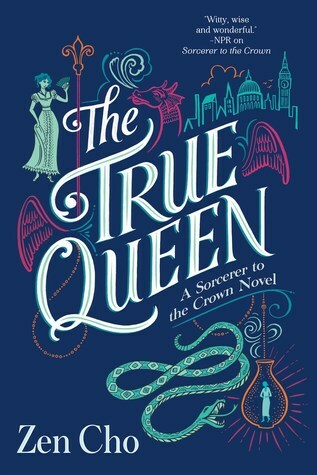 I have the first book still on my TBR, which I plan on hitting up as soon as I finish the final two books in the first series. This will be a long-term project, I think! From the amazing team at Night Shade Books and Talos, I also received the following finished copies: Black Moon: The Complete Tales of Jules de Grandin by Seabury Quinn is the fifth and final volume collecting the stories of the eponymous supernatural detective made famous in the pulp magazine Weird Tales; Astro-Nuts by Logan J. Hunder is a quirky little novel of sci-fi comedy from the same author who brought us Witches Be Crazy, a book I read a few years ago and just couldn’t get into its brand of humor, but if you enjoy a lot of slapstick and puns, maybe it could be your thing. 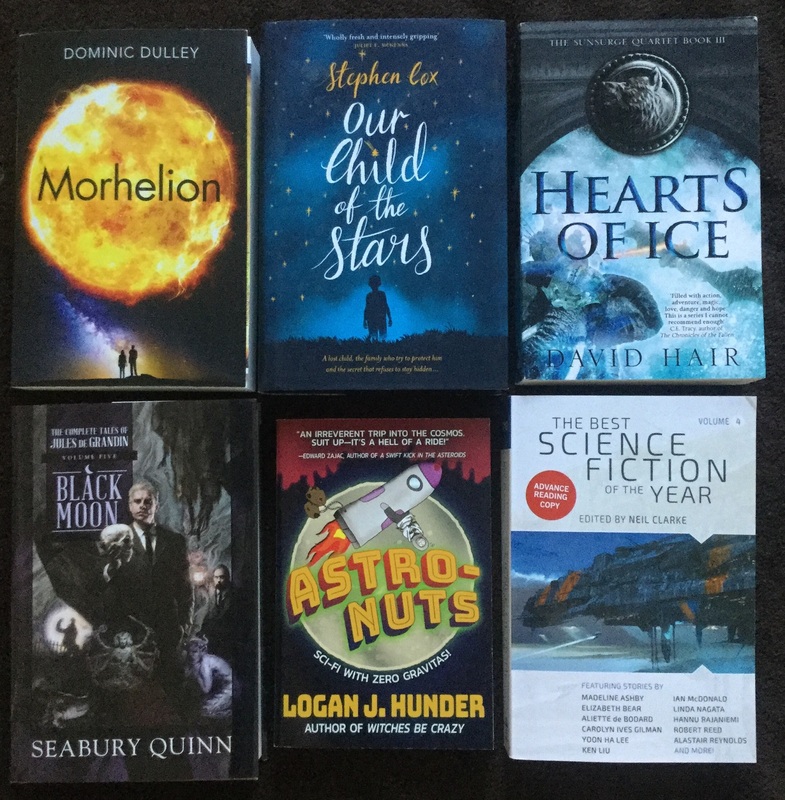 Lastly, the publisher also sent along an ARC of The Best Science Fiction of the Year: Volume Four edited by Neil Clarke, the latest anthology of buzzworthy stories from the best and biggest names in the genre. With thanks to Simon & Schuster for sending along a copy of The Astral Traveler’s Daughter by K.C. Archer, the follow-up to School for Psychics. I still mean to check out this series, so I was really glad to receive book two. 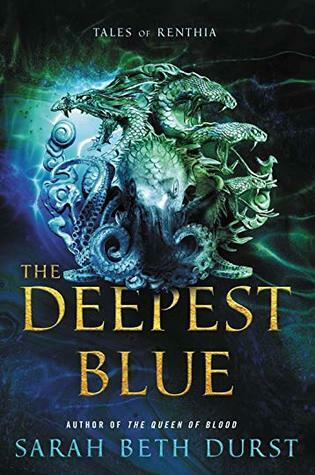 And also huge thanks to Harper Voyager for this gorgeous finished copy of The Deepest Blue by Sarah Beth Durst, a standalone novel set in the author’s incredible world of Queens of Renthia. I’ve already read this and loved it, so my review should be up soon. From Saga Press, I was also thrilled to receive an ARC of Storm of Locusts by Rebecca Roanhorse, sequel to Trail of Lightnight. As of this writing, I am about halfway through already and so far it’s a blast. Thank you also to Orbit Books for A Time of Blood by John Gwynne, the highly anticipated sequel to A Time of Dread! 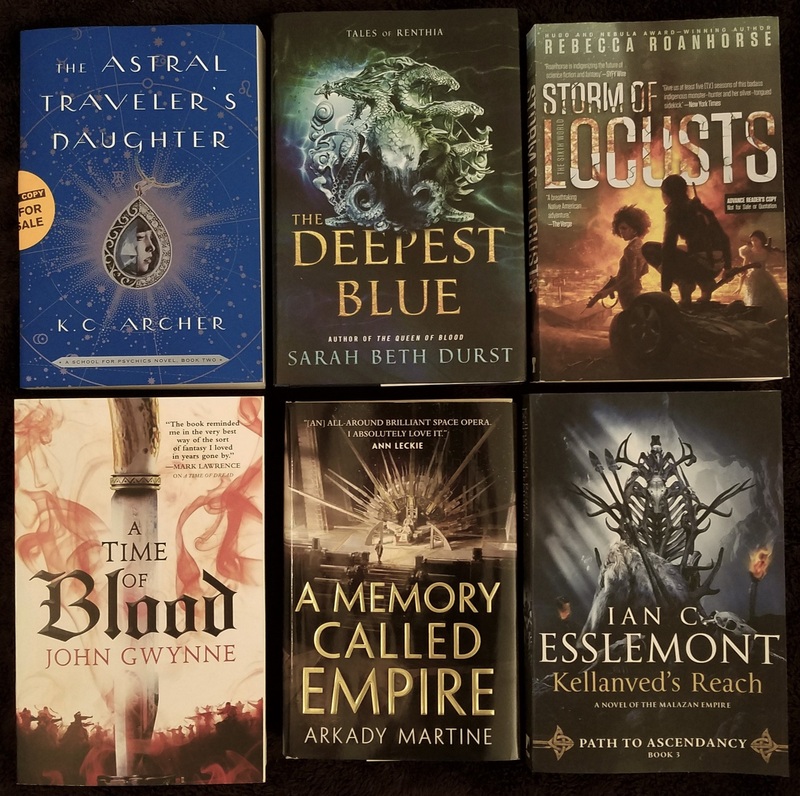 And a big shout out also to Tor for A Memory Called Empire by Arkady Martine, a space opera I’ve been curious to read ever since I first learned about it, as well as Kellanved’s Reach by Ian C. Esselmont, book three of the Path to Ascendancy series taking place in the world of Malazan. Last but not least, a special thanks to Tor.com for this mysterious little box I received last weekend. 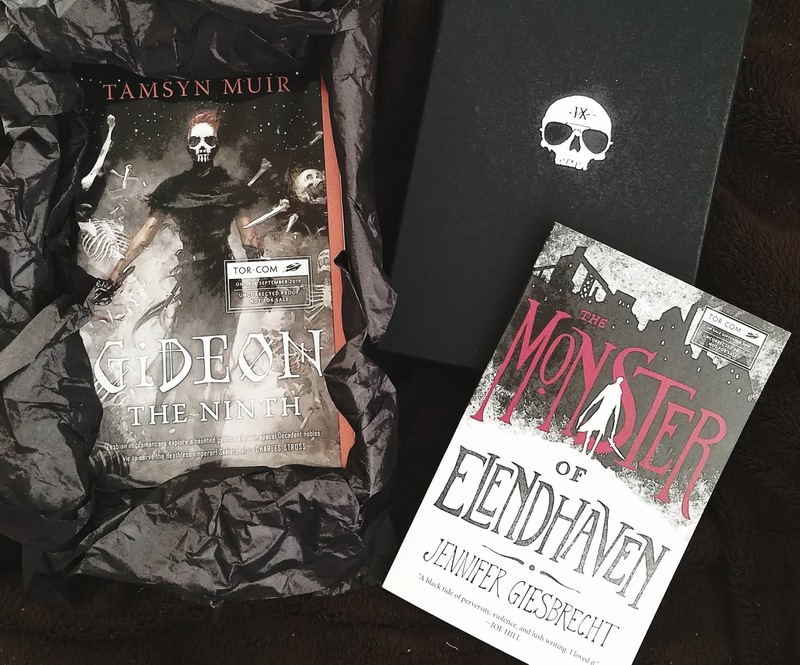 Inside its ominous skull-adorned packaging, however, was a delightful treat–ARCs of two of their exciting upcoming releases, Gideon the Ninth by Tamsyn Muir and The Monster of Elendhaven by Jennifer Giesbrecht. The dark theme could not have been more perfect! I can’t wait to read both these books. 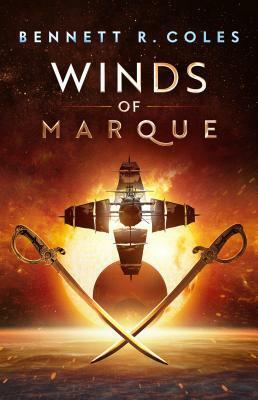 On to the digital pile, courtesy of Harper Voyager I was sent an Edelweiss link for the eARC of The Winds of Marque by Bennett R. Coles, which I couldn’t resist because this book had long been on my watch list. 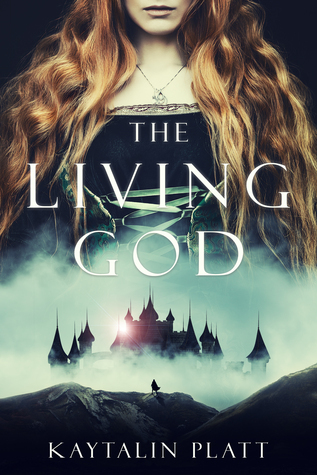 In the past I’ve also read some great stuff from Inkshares, so when I saw the description for The Living God by Kaytalin Platt, I decided I wanted to give it a try. 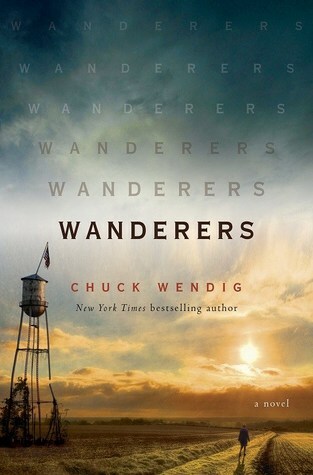 From NetGalley, the moment I saw Wanderers by Chuck Wendig pop up from Del Rey it was an immediate request, for although the last few books I’ve read from him were not his best, I am still a big fan. 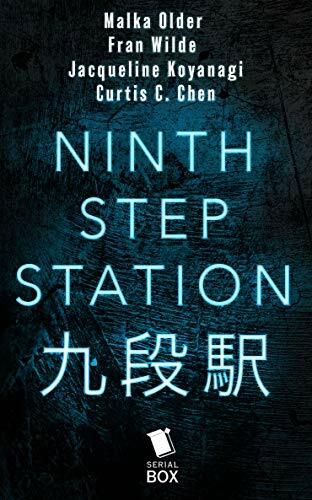 And at last, the first season of the serial Ninth Step Station by Malka Ann Older, Fran Wilde, Jacqueline Koyanagi, and Curtis C. Chen is finally completed, which means I can finally binge all the episodes at once. With thanks to Serial Box for providing a review copy in both ebook and audio formats. 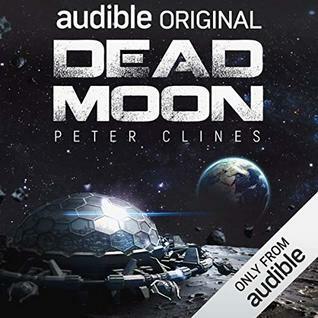 In the audiobook haul, thank you to Penguin Audio for the psychological domestic thriller My Lovely Wife by Samantha Downing, Macmillan Audio for a listening copy of the mystery fantasy The Perfect Assassin by K. A. Doore, as well as Audible Studios for the third Threshold novel Dead Moon by Peter Clines. Your bookshelf is certainly alive and well! So many fantastic books in this post. Astro-Nuts looks like a ton of fun, but slapstick is SO hard to pull off in books. Then again, anyone who comes up with a title like Witches Be Crazy might be right up my alley … Thanks for featuring it! Yeah, humor in general can be so subjective! 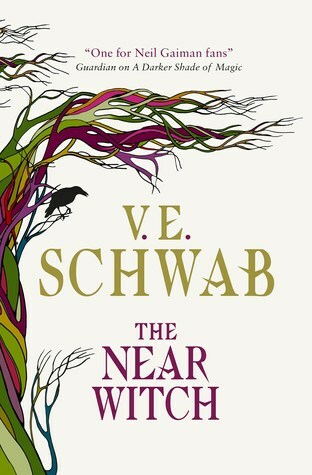 I had high hopes for Witches be Crazy when I read it, but the comedy was just too silly and over-the-top for my tastes. But for the right person, I can see his books working very well! I’m hoping Atlas Alone is really good and will be avidly watching early reviews! Hearts of IceIce and Best SF of the Year are also two I’ll have my eye on. Looks like a pretty great up line up you’ve got on deck! That box from Tor looks awesome! I remember you weren’t so sure about A Memory Called Empire in one of your previous posts, but I read an arc and I really liked it. I hope you’ll get to it; I’m interested in what you think about it. Recent discoveries: The Sword of Kaigen by M. L. Wang. I thought it would go well with Sekiro to keep me immersed in feudal Japan world, but it gripped me completely. I know how that feels! Too many good books, too little time. Time of Blood is high on my list too, but I just don’t know how I’ll fit it in! I just finished Storm of Locusts tonight, it was awesome! A brand new adventure, but feels like the first one in terms of tone and style. I JUST pre-ordered Kellenved’s Reach in hardcover. Once I get it it is going to the top of the list and I’ll be reading it right away. Yeah, I’m just so confused about all the books set in the world of Malazan, and I don’t think I’ll ever be able to keep up, but I hope you enjoy KR when you get it! I like that cover for Gideon! Nice and creepy looking! I’m a couple of books behind with Patricia Briggs so hopefully I’ll get caught up before the year ends! 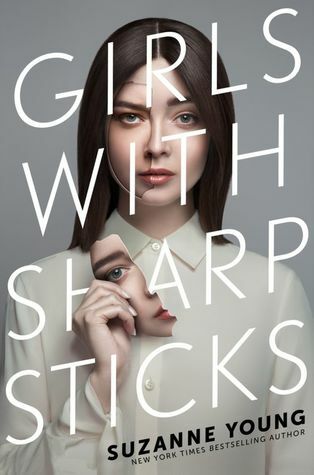 Yeah, I’m so excited to check out those Tor.com books – great covers! OOoh very nice! Seeing lots of new to me reads here! Like everything except Briggs! Lol! Seeing some eerie covers among them too! Looks like you’ve got quite a lot of great new reads! I hope you enjoy each and every one of them! Definitely can’t wait for Briggs, her Mercy Thompson books never disappoint! OMG Mogsy there are so many!!!! I own A Time of Dread (impulse buy in London because the cover is stunning!) but haven’t read it yet! So I am curious to read your thoughts on its sequel. 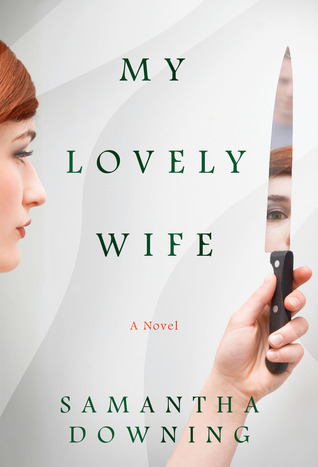 And I listened to a sample of My Lovely Wife. That seems something! Nice, I hope you enjoyed what you sampled of My Lovely Wife. The synopsis sounds insane! 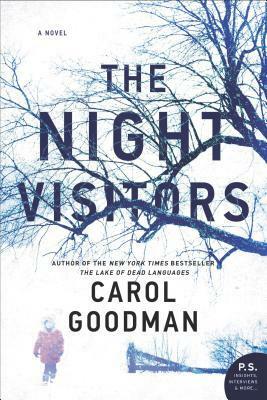 I’m feeling in the mood for a psychological thriller so I might actually listen to that real soon! I should be getting a physical ARC of Storm Cursed, so excited to get my hands on it! 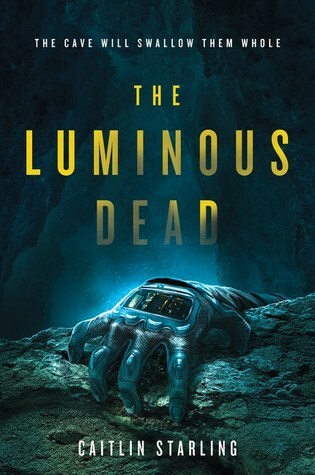 I didn’t realize Deepest Blue was Renthia, I’ve had the first two books on my Kindle for far too long – they’re on my ever-growing series read list! The publishing gods have definitely been kind! 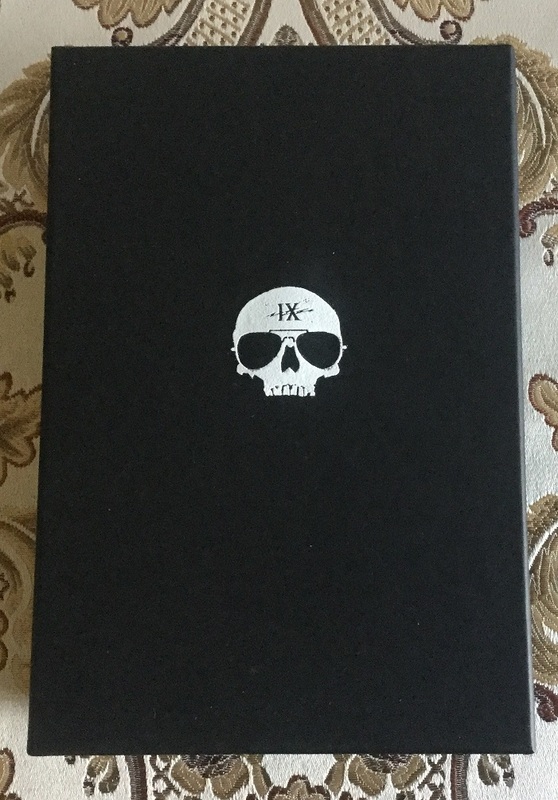 Yeah, I was really surprised when I checked the mail and saw that box with the skull! I had not expected the books, and if it hadn’t had the Tor.com logo on the side of it, I think I would have been afraid to open it, lol! Wow that’s grat! Just finished Storm Cursed and I love Holy sister! Happy reading! Oh my goodness, I hope you enjoyed Storm Cursed! Super jealous you already have access to Wanderers! 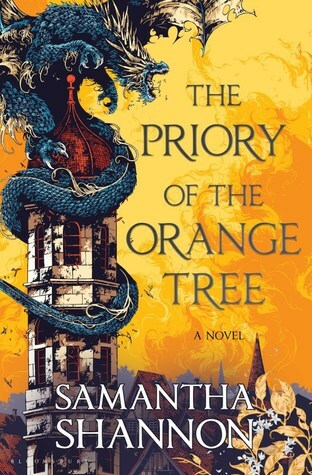 I am so curious about that one and really excited to read it when it comes out. I haven’t heard of Bradley P. Beaulieu before, either, but his novels sound really interesting, so I’ll have to check them out. Yeah, I’m really hoping Wanderers will be a winner! The last couple of Wendig’s books I read were sort of disappointing, but they were both in the Miriam Black series and that one has been sort of going downhill since it hit the midway point. So I am crossing my fingers that this is the fresh start both the author and readers need! I actually have only ever read Invasive by him and I did enjoy it, but it wasn’t my favorite book ever. But The Stand by King really blew me away and everyone is saying how it’s similar to that, and if Wendig can make me feel what King did with that book…it will be incredible, in my book. That’s an awesome package from Tor. I want to read both of those books. The darker the better! That’s a great reminder to read The Purcell book – I so loved her first book. I love that Tor box – so cool and the books look fantastic – hope you love them. Yeah, I’m burning to get to that Purcell book. Like Tammy said, The Silent Companions will be a tough one to beat, but I have a good feeling! Wow! You’ve gotten lots of fantastic books lately!! Hope you love them all! Aaaah, so many good books! So excited for Storm of Locusts! Also that Tamsyn Muir book has me fascinated for sure. Hope you enjoy!